As we drove in and through and around so many states, towns, and cities this short trip, it was incredible to me what I saw, what I loved, what lovely people I met and how I wish I could do this for a full year and see every state. Just not in July or August, and not doing all the driving. I’d buy a Class A Motor Coach, hire a driver, then sit back and enjoy the views as they go by. Illinois (late entry to list, seeing I bought lottery tix in Illinois) Not sure where we went through Illinois! Can anyone figure it out for us? Most Difficult Interchange to Find: Route 64 East. NO signs for it anywhere before St. Louis. Means looping around 270 to 255 and then praying you are going the right way! Least Favorite Place Visiting: William Jefferson Clinton Center, Little Rock. It’s like the building was dropped into Little Rock with no respect to the landscape. It’s a giant modern edifice surrounded by low country buildings. Plus, with no Clinton living in AR, there was a serious disconnect to the library being where it is. Most Expensive Venue: Crystal Bridges special exhibits and FLW tour. NEVER saw another New York plate, not one. And one wonders why Trump won? NEVER saw one Connecticut plate. And one wonders why Trump won, redux! Mostly saw plates of the region I was in – Tennessee, Arkansas, Texas, Oklahoma. Calling Roadside Assistance from Cell Phone: No uniformity across state lines. Some were *SP, others were *77. Many times there was no sign. Driving Quirk: Would regularly note route mileage markers. This is in case we broke down and had to call for help. Yes, cell phone location was on, but in many cases, there was limited or no cell service. Colleges Colleges Everywhere: Every county had a technical/community college. Many small traditional colleges dotted the landscape. Many Christian colleges too. Camping Rules in the Heartland! I can’t begin to tell you how many families we saw on the road towing a giant 5th wheel camper. Far more 5th wheels than motor homes. The 5th wheel group tended to be younger, with smaller kids. The motor home crowd was like us, empty-nesters. RV parks at almost every interchange, and from what we could see, all full to the brim. Camper World dealerships and camper repair shops popular. Most Seen Truck Brand: Hands down, Chevrolet. No doubt about it. Dually trucks rule too. Mile long huge Chevy truck dealerships in otherwise remote locations. Funniest Electronic Road Sign Seen on Interstate: Hey you, that’s the temperature, NOT the speed limit! American Flags Are Waving: Seen all along our route path – on houses, at stores, at car dealerships, at hotels, at attractions, on people’s cars (decals). I repeat, is it any wonder why Trump won????? Not if you pay attention to the heartland! Trump did. Hillary didn’t. Oddly, once back north, starting about Maryland, the flags disappeared. Blue state versus red state mentality? I think so. Farming: From crops to cattle, farming and ranching is king in the states we visited. Miles upon miles upon miles of open farmland, with crops growing tall and blowing in the wind. Corn and soy. Wheat. Proud farming families, many in their sixth and seventh generation of owning and farming the land. Rugged men. Cowboys a different breed than the crop farmer but same pride. My hats off to all the farmers of this land. It’s a tough job. God and Churches: Omnipresent – crosses and churches – some mega churches, acres wide and seating thousands, to small parishes, very old buildings, tending to a flock of a hundred or less. One night, eating at a local diner and the place was pretty empty, we overheard the waitress say “in ten minutes church will let out and we’ll be mobbed” and this was a weeknight. Church isn’t just on Sunday anymore. Now Hiring: Yes, America is hiring. Sprawling manufacturing plants. Small business. All with banners announcing they are looking for workers. This is a good thing. Amish: Go forth and multiply must be their motto because darn if they weren’t everywhere in small town USA. Women in the traditional white cap and simple frock. Men in straw hats. Never saw horse and buggies tho so perhaps the new Amish drive. They must because many of them build barns etc. Trip Regret: Skipping Louisville. I could see it’s well worth a visit but more than the two days we planned so it’s on a list to see separately. Keeneland. Churchill Downs. Versailles. Bourbon Trail. Downtown Louisville looked really pretty, on the Ohio River. Waste to bring and never used: laptop and snack bag. It was preferable to us to stop than eat in the car. Threw the most money away on PowerBall and MM tix in every small town we stopped, sure THAT one would be the winner. Not one. Forgot I brought: bag with extra good walking shoes. Finally, note to self: Do not take mini Junior Mints and leave in hot car. Thanks for coming along. Where are we going next time??? Excellent overview and notes. You really went with eyes wide open. Thanks for telling us what you saw. Next? I’d go to the Dakotas but that IS someplace you want to do in July or August, not November! yes, I’d love to do North and South Dakota, Wisconsin and northern Minnesota too. I’ve done all the western states pretty thoroughly, so too the east coast. Did you calculate how much you spent on gas, hotels, and food? I wonder if it was more than had you flown and seen places separately rather than the road trip idea. Saved all receipts but have not tallied the damage. We have one argument to deal with re the hotel in Knoxville. Long story. The Audi got great gas mileage, a tank would go 520 miles. We stopped often just to get out and see things and would always fill up, even if the tank was only a quarter down. Flying would mean not seeing America up close and personal. That was the BEST part, far better than some of the venues. You should be a full time travel blogger/reporter. You have s real talent and a great eye for details. I think if I had a life do-over, I would add being a travel expert, like Wendy Perrin. Create a eponymous brand and get paid to write about places seen. It’s not too late. With our age group spending money traveling, you could be a columnist for seniors. Did you forget NJ on your state list? I did skip putting NJ on the list but for the same reason I didn’t put NY on the list. It wasn’t a place I stopped – only a means to the end. you only briefly touched upon drug use and homelessness. can you share your overview on these subjects? The most dramatic case I saw was in Knoxville but mostly I think it was because Knoxville was empty, void of tourists, so the homeless stood out like a sore thumb. So too the men coming down off some drug high. Men sitting on benches and under overpasses. All white men. In the 40+ age range. Winchester Kentucky, stopped for gasoline and decided not to even stay at the station. Seriously rough looking men and women. Maybe the town is lovely, but off the highway, no way we were going to take a chance. Several places I was asked to give money – women each time asking me for a dollar or two. I did not, but would follow up asking inside the convenience mart, seeing if I should. I was always told No, do not give. I found that interesting. Saw no signs of issues in Bentonville proper where our hotel was. I’m wondering if Walmart/Walton money has donated enough to help fight homelessness and or drug abuse. Little Rock seemed rough. No doubt opiod use is a killer in small town America. Where are all the restaurant reviews?? BBQ? TexMex? Fish? Steaks? We’re abject failures in the food eating and review department. Our schedule was breakfast then late lunch. No dinner except once in Dallas. We figured we could have added $1000 to the trip by dining out nicely and that wasn’t the goal. We ate at local diners, hangouts for cops and farmers – right up our hick alley. Simple frocks and white caps can be Mennonite too, not just Amish. And Mennonites can drive cars. My cousin married into a Mennonite family. They covered the chrome on their cars to become the textbook “black bumper” Mennonites from Lancaster County. Lots more of them around too. Yes, you are right. 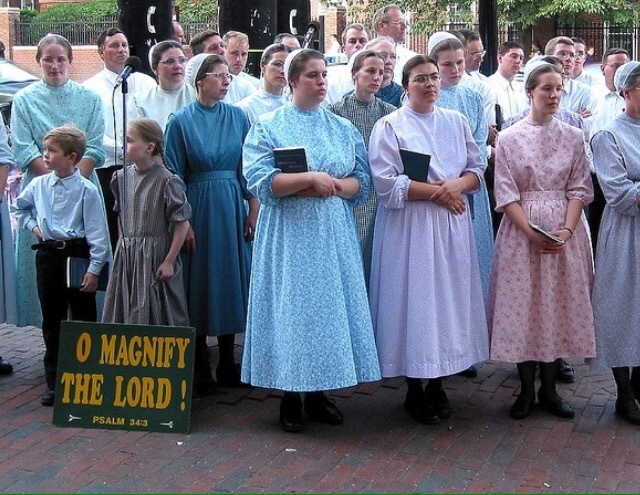 I had forgotten about the Mennonites. I need to do a compare and contrast between Amish and Mennonite. Thanks for adding that to the thought process. We saw mostly these women. Not sure if this is Mennonite or Amish. The dresses were flowered and the caps white. after reading about it your photo seems to be Mennonite. Thanks. I had trouble finding a real compare and contrast when googling. Lots of oddball websites. What did you think about the heat and does that influence where you will look when you leave NY? I confess the heat index in Florida summer gives me some pause. And I generally like hot weather; maybe just not every hour of every day. Not much difference in temp from Riverside, but the devil is in the heat index details. Great travel reports! Thanks for sharing. The heat was hard to take so yes, that’ll weigh heavily in the decision of where to go. That’s why North Carolina remains number one. An old friend who has lived in Austin TX for close to 45 years now says the days of 100+ temps and heat index is all forgiven and forgotten when in January it’s 70 and heavenly. I can’t imagine living in Arkansas. Tennessee maybe because of all the lake living and the mountain vistas. Although SoundBeacher said in an old comment that they were sorely disappointed in Gatlinburg. Lots to consider. Heck, maybe I’ll stay in Bedford!! Did you have a congeniality index (nicest versus not-so-nice) for the visited states? How about best versus worst drivers? I was going to suggest going to see all the FLlW buildings in Racine WI, but, after the bust in Bentonville, that ain’t happening. Texas, Texas, Texas, Texas – winner in every category, no matter what you ask me. TEXAS!!! The only not-so-nice was our mistake – being in Knoxville when no one else was. 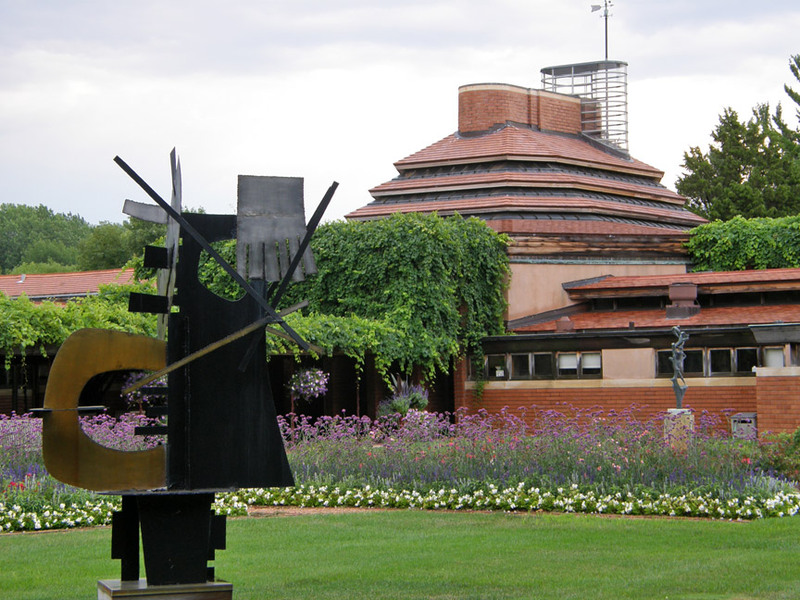 As for the FLW Johnson House in Racine, if I ever get to Racine (unlikely) I might consider seeing Wingspan. Have you done a Canadian road trip lately? Drive up through VT for the Eastern Townships then Quebec City or Maine for the Atlantic provinces. For a few days we needed the a/c.. Will pull out a blanket for tonight. Nice to have the house open to the air. Your travel perspectives are the best regardless of where you go. Thanks for taking the time to write about your trips. We did do a Canadian road trip, two actually in the last few years – Quebec City and Montreal. Had a marvelous time in old QC – Montreal was nice but not my favorite. 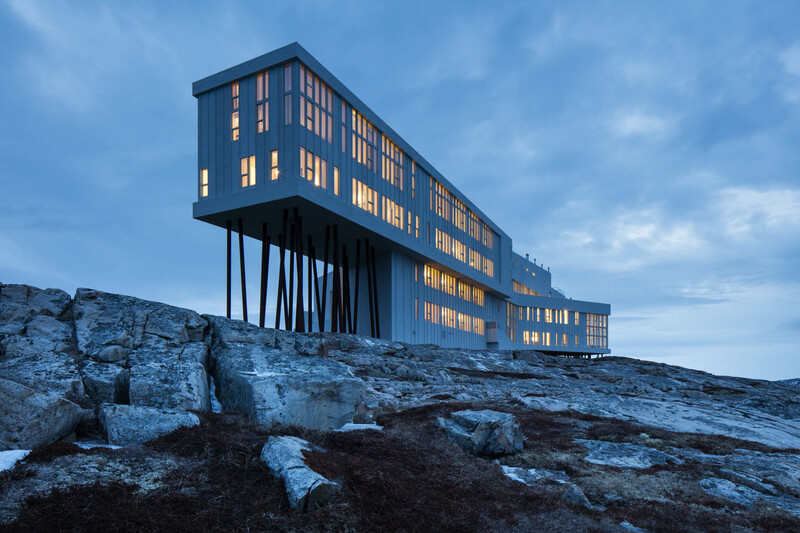 I’d like go see Fogo Island but I understand it’s near impossible to get to and outrageously expensive, getting hipsters from Brooklyn and LA. What an architectural feat is that inn! Getting there is no picnic, though. I had no idea it existed. The things I learn from this blog amaze me. My eyeballs fell out of my sockets when I saw what it costs to stay there. I first learned of the Inn about a year+ ago, seeing Tommy Smythe Instagram feed staying there. My takeaway: coastal elites are clueless about what makes America tick and why Trump won. Your observations are spot-on. No better way to see how Trump won the Heartland than this map….what I think is many people may not have liked Trump the man per se, but they loved that he loved America, loved that he loved the flag, loved that he loved Christians. Since you don’t read the NYT, this is amusing. Oh my oh my oh my. I don’t even know what to say. I didn’t see any comments with the piece. Honestly, I don’t believe one word of the article. You entered Illinois wen you crossed over the Mississippi in St. Louis and from what you described, you were in Illinois for quite a while on 64East on your way to Louisville. Duh, of course. State lines were blurred on such a long stretch of road. Thanks for the tutorial. You win the bag of melted and re-refrigerated Junior Mints! OK?